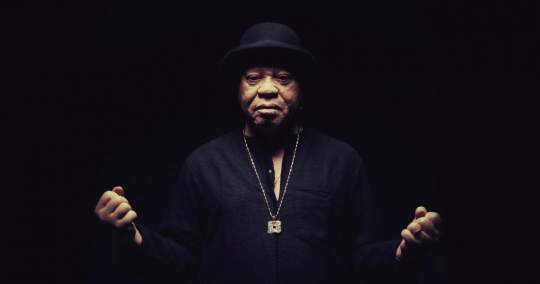 Salif Keita has been called "the Golden Voice of Mali” and "the Golden Voice of Africa," but both epithets sell him short: he is one of the world’s greatest living singers. His voice is not confined by geography or metallurgy – nor, evidently, by age; 69 years after singing his birth cry, it sounds as strong and supple as ever. However, we may be hearing his swansong now. His international concert series this past year was billed as a farewell tour, and he has indicated that his new album will be his last. Keita’s story is well known, but it warrants retelling. Though a descendant of the royal family that founded the Mali Empire in the 13th century, he was born into poverty in a village beside the Niger River, and he was born an albino. As in too many parts of the world, albinos in Africa have been regarded as embodiments of curses and carriers of misfortune. Abused and shunned, young Keita found solace in music, but he was constrained by hereditary roles (noblemen hired musicians; they could not be musicians), so at age 18 he left home for the Malian capital, Bamako, where views on albinism were a little more enlightened and no one knew his ancestry. He subsisted by busking on streets and in marketplaces until he got a regular gig at a hotel adjacent to the central train station, performing – and soon recording – with the Rail Band. After three years riding with the Rail crew he accepted an invitation to join another hotel band, one that was more open to performing his new compositions. That band, Les Ambassadeurs, became the most popular in Mali and, true to its name, toured neighboring countries as well, eventually relocating its embassy in Abidjan, the booming capital of Ivory Coast. In the mid-1980s Keita began spending much of his time in Paris, and there, in ‘87, he recorded his first solo album, Soro. 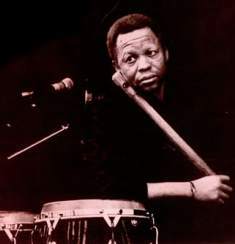 A set of original songs deeply influenced by traditional Mandinka music and literature but audaciously rendered on electric guitars and synthesizers and crowned by the thrilling range, dynamics and textures of Keita’s voice, it drew attention from beyond the small circles of African-music fans in Europe and America. 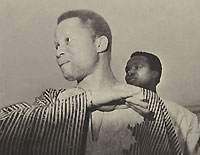 Though the studio production verged on over-the-top, in concerts Keita proved to be a compellingly authentic performer, and he quickly became an international star. But rather than adhere to a tried and true formula, Keita continued to experiment and develop. He ventured into rock, reggae, hip-hop, contemporary jazz, French chansons and film scores, collaborating with artists such as Joe Zawinul, Wayne Shorter and Carlos Santana, Bobby McFerrin, Esperanza Spalding and Snarky Puppy. Some of his stylistic choices have been perplexing, others inconsequential, but everything he has produced is worth hearing. His hits always sound great ("Nou Pas Bouger," his immigrant rights anthem from 1989, is still apposite and rousing), and much of his oeuvre is excellent – music to listen to time and again with undiminished appreciation. The three albums he made in the ‘00s, Moffou, M’Bemba and La Différence, are masterpieces. Moderating the electronics for a more natural sound and forgoing cosmopolitan genres in favor of a distinctive personal style of Malian music, he found an exquisite balance of tradition and modernity in each song and attuned, even more impressively than before, the strengths and subtleties of his singing to the character of his compositions. 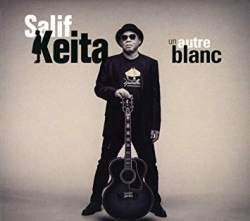 Now we have Un Autre Blanc, Salif Keita’s 12th solo album. Whether or not it proves to be his last, it sounds like a summation of his career, a valedictory. According to his publicists, one song, "Lerou Lerou," recounts Keita’s "long musical journey” and expresses "deep gratitude for those who helped him along the way.” The album doesn’t revisit all of his musical adventures (that would require a multiple-CD set) but it touches on those that still appeal to him. A song might contain a few measures of rock, funk, jazz, techno-pop or hip-hop, but it isn’t in one genre or another; it’s always a uniquely Salifian song to which the composer adds an allusion, an homage, an unexpected flourish or perhaps an inside joke. The sole exception is "Mansa Fo La," a straight-through reggae tune that Keita co-wrote and recorded with Alpha Blondy. "Tonton," for example, starts with three electric guitars playing in the scintillating neo-traditional style developed in the ‘70s by the Rail Band’s Djelimady Tounkara (who’s heard in another song in the set) and Les Ambassadeurs’ Manfila Kanté (whose younger brother, Djessou Mory Kanté, is all over this album), but when it comes to the chorus one guitar shakes out grungy power chords punctuated by staccato horns from the James Brown playbook. Keita is audibly invigorated, singing about the passion and the irony of love between an old man and a younger woman. The sudden turn is surprising, but it doesn’t come across as a gimmick or a sop, and after a few listens it sounds perfectly fitting. The album’s most startling musical juxtaposition is in "Gnamale”. The song starts with an ngoni (harp) soon joined by a bala (xylophone) and an acoustic guitar in a gently loping rhythm. The first voices heard are immediately recognized as Ladysmith Black Mambazo. The next voice sounds like a robot in a bad sci-fi flick. It’s Keita, auto-tuned. In his entire career there has never been such a WTF moment. Why auto-tune a flawless voice, particularly in the company of Black Mambazo’s plush harmonies? The song is partly about the power of words; that power is in their meaning, not in the voice that speaks or sings them. Perhaps that explains the voice manipulation, but what's really remarkable is that the effect is, well, positively effective. Other songs are fairly serene. Set to acoustic stringed instruments, "Tiranké” is a lovely tribute to a mother whose children have persevered to become self-sufficient after her premature death. "Diawara Fa” features the Nigerian singer Yemi Alade, who possesses a winsome soprano and sings in English (a language seldom heard in Keita’s repertoire). But one song pulls out all the stops. From the opening drum cadence, "Itarafo” evokes a funky carnival parade. Keita is joined first by Angélique Kidjo, who matches his vigorous voice and high spirits, and then by the Afro-French rapper known as MHD, who holds his own between these two dynamos although he’s young enough to be Kidjo’s son and Keita’s grandson. A robust horn section enhances the Mardi Gras festivity, and when participants start whooping and hollering, it’s hard to refrain from joining in. 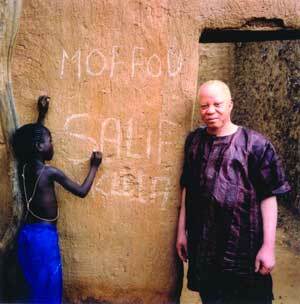 Find out more about Salif Keita's fight for Albino rights.